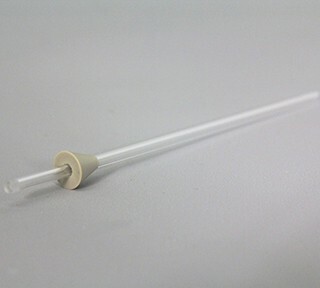 The Thermowell with Resin Disruptor is a sapphire sheath used to protect the fiber-optic temperature probe. The Thermowell with Resin Disruptor is a sapphire sheath used to protect the fiber-optic temperature probe from damage during operation of the Liberty Blue. The resin disruptor is a PEEK fitting on the outside of the thermowell that serves to break up clumps of resin and ensure even mixing during synthesis.